While Amazon.com first made its name as an online bookseller, DVDs are just one of the numerous product lines the store now carries. Most DVDs are available for less than full retail price, although discounts vary greatly from title to title. Check the main page of both the site and the DVD section for special sales and promotions. If you're buying multiple DVDs, Amazon.com's free shipping on orders over $25 can also help you save money. Amazon.com also offers the Marketplace where other merchants can sell new and used copies of the DVDs that Amazon.com carries also carries. This can be a great place to buy cheap DVD movies online. Look for the "more buying choices" link on every product description page. Read product descriptions carefully to make sure the condition is acceptable to you. 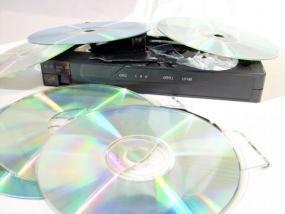 Some of the cheapest DVDs may have scratches or damaged cases. Marketplace sales are backed by Amazon.com's customer service policies, and all transactions take place through the Amazon.com checkout, making for a secure shopping experience. DVDPlanet offers discounted prices on thousands of DVDs. While the site's everyday prices are often similar to other online retailers, frequent sales provide great bargains, and they also offer coupon codes. DVDPlanet also sells a selection of used DVDs. eBay is a common place to buy cheap DVD movies online. Read all auctions carefully before bidding, especially shipping charges. Some sellers will raise the cost of shipping to make up for a cheap selling price. Half.com is eBay's fixed-price site for used and new items. Discounts vary depending on the seller and condition of the item. Read sellers' comments carefully to avoid unpleasant surprises in the quality of your purchase. Compare prices - When looking to buy cheap DVD movies online, taking a few minutes to compare prices means more money in your pocket. Your favorite online store won't always have the best price on every release, and even retailers with high prices sometimes hold great sales. Use a price comparison website like PriceGrabber.com or Froogle to make the job easier. Look for coupon codes - A coupon code works like a coupon you'd redeem at a brick and mortar store, except instead of turning in a slip of paper, you submit a string of letters and numbers when you check out. Common discounts include free shipping, a percentage off an item, and $__ off a $___ order. You can find most coupon codes by searching for "site name" and "coupon code." Numerous websites also catalog existing coupon codes. CurrentCodes.com and CouponChief.com are just two of the possibilities. Be aware of shipping costs - When comparing prices, don't forget to factor in the cost of shipping. A $4.95 shipping charge can quickly negate any deals you've found. When it comes to shipping, patience also saves money. You'll pay a premium for priority or overnight shipping. Don't put a price on security and customer service - Sometimes a great deal isn't worth it if it means buying from a fly-by-night operation with shoddy customer relations. If an online merchant doesn't offer a secure website for credit card transactions, there are hundreds of complaints about the company online, or something doesn't just feel right about the site, trust your instincts and find another source for your favorite DVDs. Avoid bootlegs - Bootleg, or illegal, copies of DVDs, are a common problem with box sets of television shows and anime series, although even buyers of single movies should be aware of the issue. Signs of a bootleg include fewer DVDs than the official release, all-region encoding, different DVD artwork, sellers in Hong Kong and Taiwan, and Chinese subtitles. Watch deal forums - Users at forums like FatWallet and DVD Talk have their eyes on the best deals, and they're quick to share them with other users.